A development application has been submitted by 11 Ludlow Pty Ltd to build a new mixed-use development located at 2 Oxford Street, Bulimba, adjacent to the Bulimba Ferry Terminal. The development usage is predominantly split between retail and hotel use and incorporates a new 135 sqm public park and boardwalk which extends the public realm onto the waterfront. 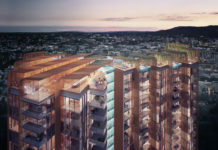 The development has been designed to target specifically the intent of the Brisbane City Council’s River’s Edge Strategy 2013 and aims to support the use of as a river tourism destination. Designed by Damilvi Architecture, the design intent of the development seeks to embrace the uniqueness of the site by ‘hero-ing’ the river and the built form’s engagement with it. At the entrance of the development, it is planned that pedestrians will be drawn to the ‘River Park’ with the parkland acting as a centrepiece to the whole development. The development application number for this project is A004819422. Okay, so people will be “drawn to the river park” by walking through a “tunnel” under a three storey plus rooftop terrace complex that oddly is obscured by the ferry terminal in the render? It’s a nice development, albeit with some fairly odd planning, and the retail tenancy to the North side of the core is unlikely to be terribly successful unless it is a hatted restaurant or hundreds of people, however I don’t feel it quite addresses the River Edge Strategy by building a several storey structure over the only access past the building while it would just as easy for the walkway to pass in front of the terrace. Not sure about the scale given the lack of information referring to the surrounding properties. The proposal does not pay respect to the historic and beautiful Bulimba ferry terminal. The Terrace section (3 levels) adjacent to the terminal is too tall and too close to the old ferry terminal building which has not been rendered realistically (there is a clock tower on top of the roof, the roof is a different shape, the height and the walls are shown incorrectly. Some of the drawings indicate a section of building cantilevered over the Oxford Street lot boundary and obscuring the Ferry Terminal. Section AA is not notated on the plans and incorrectly represents the Ferry Terminals relationship to the site. 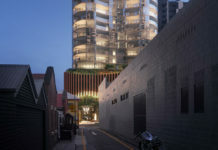 The proportion of hospitality space is out of proportion with the retail and residential components and the “dead end” landscaped area has limited appeal to locals when there is parkland and riverwalks already nearby. Architectural criticisms aside (I’m certain the BCC will insist this building is pulled back further from the ferry terminal so lets not worry…) the designer will have trouble finding a fire engineer who will support the exit travel distances from Class 3 areas – it always surprises me this is rarely resolved at DA stage when it changes the design so much to fix it up!